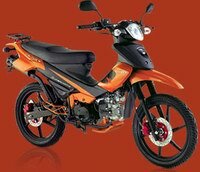 Harga Motor Kanzen Supermoto here is the average price of the Big City Like: Jakarta, Bandung, Medan, Surabaya, Semarang, Makassar, Denpasar from various stores and authorized Dealers. Kanzen Supermoto can be used as a mirror to the more established local car manufacturers. Kanzen Supermoto presents with a variety of advantages especially in terms of features and functionality aspect. Starting from the double disc brakes, suspension monoshock, until hi mount exhaust. With a capacity of 120cc engine which produces power for 10hp and 8.8 nm under plus the price is under his competitors, Kanzen Supermoto not impossible can become the new standard of homeland motor products. Inti Kanzen Motor how serious they are to dominate the national market at least to be able to compete with the Kawasaki, Bajaj and TVS which are relatively still within realistic reach of the national motor manufacturers Kanzen as national pride.